Look up on a cloudless day and what do you see? Blue. Deep and limitless. Perhaps it is no wonder that this color is the favorite color of 42 percent of men and 29 percent of women, according to a sociologist who surveyed 2,000 students, faculty, and staff at the University of Maryland. Any woman whose favorite color is not blue could have told him that, as she searches for any clothing not in the blue family. (We will not even touch on the number of blue jeans out there.) 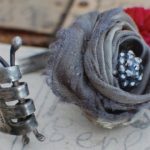 But what does that have to do with gemstones? 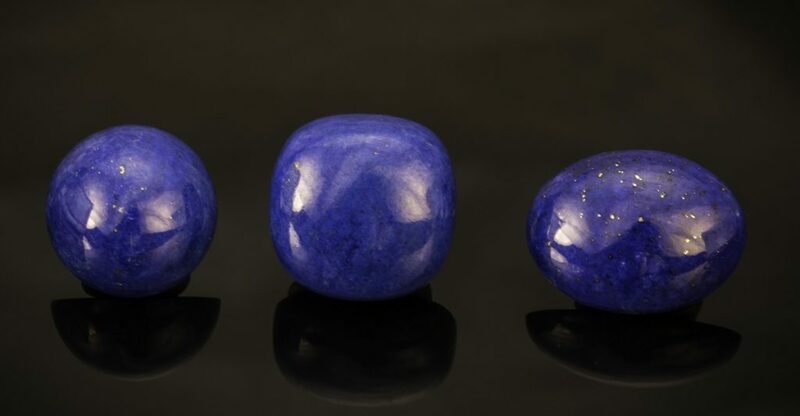 ABOVE: Dark blue gems like these lapis lazuli cabs, worn in cufflinks or as earrings, would reinforce the impression of authority and trust announced by a dark blue business suit. Photo Mia Dixon, courtesy Pala International. It’s not only clothes that benefit from the human love of blue. Gemstones like sapphire, lapis, and turquoise have been loved almost out of existence. Beloved by designers, blue is the most common color found on websites and in corporate logos. Blue is incorporated into 53 percent of the flags of the world. Blue is a cool color, which are considered calming and restful. Experiments reveal that in the presence of blue, our metabolisms slow down. It is said to reduce blood pressure and calm both breathing and heart rate. If an interior designer wants to calm and relax people, and induce them to linger, they use blues. However, long before it was possible to scientifically measure the slight bodily responses to color, ancient cultures in Egypt, China, India, and Greece used color to treat or cure illness. Cool blue—even cold blue—was considered antiseptic and astringent, making it good for sore throats, rheumatism, hypertension, and burns. Even today, those who believe in light or color therapy say that blue light can help to adjust the body clock and overcome jet lag and issues associated with shift work. It has anti-inflammatory and muscle relaxing effects. It aids in fighting both physical and mental tension. The particular shade of blue can affect the emotional impact of the color. Dark blue—think lapis, sodalite, iolite, or fine dark sapphire gemstones—signifies trust, dignity, intelligence, and authority. A dark blue suit is standard business attire for a good reason. Dark blue is also the color of mourning in Korea. 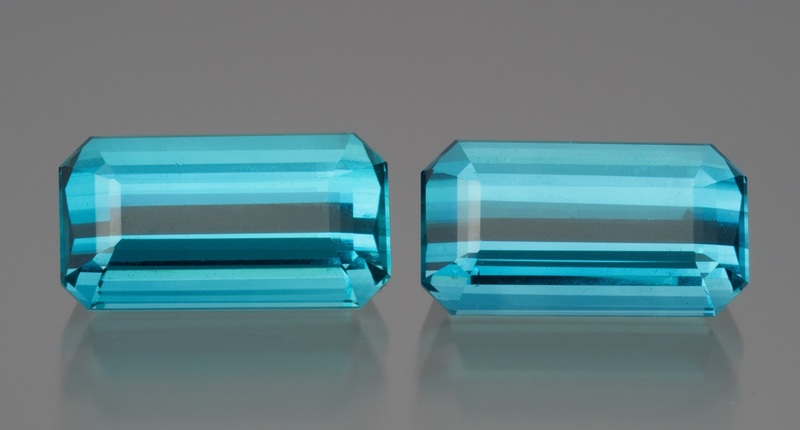 Bright blue–an aquamarine, blue topaz, Paraiba tourmaline, or chrysocolla gemstones—indicates cleanliness, strength, dependability, and a certain rad coolness. The Greeks and others around the Mediterranean believe blue wards off the evil eye, so they have bright blue eye charms everywhere. In India, the god Krishna has blue skin. Blue is the color most commonly used in paintings for the cloak of the Virgin Mary. Light blue—say, the color of the sky on a clear day, or a clear turquoise or a cab of Larimar—suggests peace, serenity, and the infinite. This 11.67 ct. Ceylon blue sapphire is the epitome of “sapphire blue.” Photo by Mia Dixon, courtesy Pala International. Blue is not without negative connotations, however. It can stand for sadness or melancholia (feeling blue or singing the blues), elitist snobbery (blue blood or blue nose), or vulgarity (turning the air blue). Blue-sky thinking might connote either impractical ideas or creative, limitless imagination. It depends on who is using the term and in what context. Humorist Erma Bombeck wrote that there is no known blue food, so any blue food in her refrigerator should be thrown out. Perhaps it is because of this lack of connection to taste or smell (unless you open containers of blue food), blue may act as an appetite suppressant. Something to think about when painting your dining room. Is blue your favorite color? Blue is often preferred by reflective, cautious, and conscientious people. They are honest, patient, and persevering. Lovers of blue may be egotistical and opinionated, but they can also be tender and affectionate. 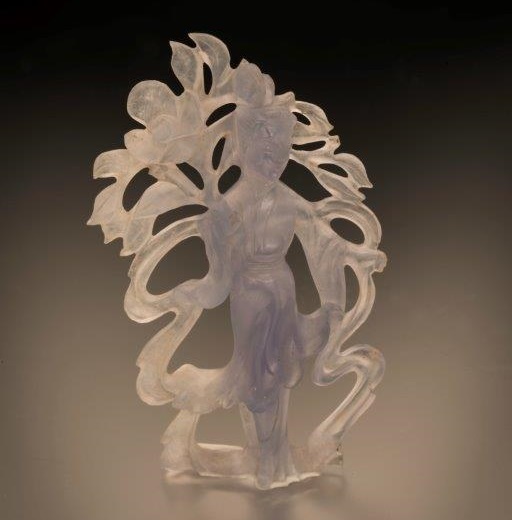 If you prefer green, don’t miss Color Psychology of Gemstones: Malachite, Chrysoprase, Jade, and Other Green Gems. Photos courtesy of Pala International.